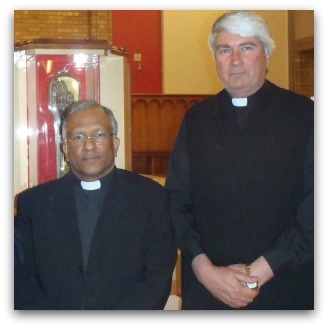 At the outset, let me apologise for the absence of the intended homilist, Fr Des Purcell SJ. Like St Francis Xavier, Des is a Jesuit who served for some years as a missionary in India. Unfortunately, he is ill this evening. Being the Jesuit superior here in Canberra, I am the substitute. Xavier was no stranger to being substitute, but more of that anon. We gather to reverence and pray before the arm of Francis Xavier. Over the years, many of us have had the opportunity to kneel before this arm at the side altar in the Gesu Church in Rome, opposite the altar dedicated to Ignatius Loyola. But its presence here in Australia confronts us with challenges, as well as opportunities. We 21st century Australians are not altogether at home with relics here in our own modern churches. But then again memorabilia are not completely foreign to our western modern mindset. Whenever the US President signs into law a new piece of legislation which is said to be emblematic of his presidency, he invites a group of key supporters to the Oval Office for the signing and then presents the signing pen to someone who campaigned strongly for the cause of the legislation. We have much more than a pen here. Even here in Australia, we delight in some memorabilia. Just on Monday, the media informed us that 'Jeff Thomson is selling the prized baggy green cap he wore when skittling the Poms 30 years ago during a vintage fast-bowling summer'. Even sports mad Aussies have some sense of the sacred. Here 460 years after his death, we are gathering before the arm of Francis Xavier who baptised tens of thousands of people in India and Japan, and who died aged just 46 while awaiting his entry to China. Hailing from Navarre in Spain, he came to the University of Paris, a keen student, an accomplished athlete, focused on worldly achievements. He shared digs with Peter Favre. They then took in the older Inigo from Loyola who wanted to introduce them to his Spiritual Exercises. Favre was very accommodating; Xavier less so. It was not until Favre went home to visit his family in 1533 that Ignatius had the chance to draw Francis into his spiritual web. Seven years later, the Society of Jesus was formed and Ignatius responded to a call from the Pope who was being pressured by the King of Portugal to send missionaries to the Portuguese possessions in India. Ignatius chose two others of his companions, but when one fell ill at the last minute, he chose Francis as the substitute. Multitudes out here fail to become Christians only because there is nobody prepared to undertake the holy task of instructing them. At a time when new geographical horizons were being opened, Ignatius' first companions placed themselves at the Pope's disposal 'so that he might use them where he judged it would be for God's greater glory and the good of souls' (Autobiography, n. 85). They were thus sent to announce the Lord to peoples and cultures that did not know him as yet. They did so with a courage and zeal that still remain as an example and inspiration: the name of St Francis Xavier is the most famous of all, but how many others could be mentioned! Wherever in the Church, even in the most difficult and exposed fields, in the crossroads of ideologies, in the social trenches, there has been or is confrontation between the burning exigencies of humanity and the perennial message of the Gospel, there have been and are the Jesuits' (3 December 1974, to the 32nd General Congregation). Nowadays the new peoples who do not know the Lord or know him badly, so that they do not recognise him as the Saviour, are far away not so much from the geographical point of view as from the cultural one. The obstacles challenging the evangelisers are not so much the seas or the long distances as the frontiers that, due to a mistaken or superficial vision of God and of man, are raised between faith and human knowledge, faith and modern science, faith and the fight for justice. As we contemplate and reverence this relic tonight, we commit ourselves afresh to go to the frontiers, crossing the bridges of cultural and religious divides, and travelling into the often unmapped territory between faith and human knowledge, between faith and modern science, and between faith and the fight for justice. Moving from physical boundaries and frontiers to existential and spiritual boundaries and frontiers, we do not stay focused on a moribund, severed arm. Rather we remember that Francis with this arm always pointed towards Christ, and always embraced all before him, especially the poorest of the poor. We pray that like Francis we might fight the good fight, finish the race and keep the faith. (2 Tim 4:6-8) In these challenging times for our Church, lets recall that when the Counter-Reformation was celebrated with the canonisation of four saints in 1622, their number did not include any popes, cardinals or bishops. Teresa of Avila, Philip Neri, Ignatius Loyola and Francis Xavier led the Church through prayer and service. We pray for the grace to respond accordingly to the great challenges confronting us in the world and within our suffering Church. As an incessant critic of frequent unorthodoxies within ES, I am at last most edified by an article, by a Jesuit, here extolling veneration of the relics, of the courageous apostolic Jesuit St Francis Xavier. "6. To praise relics, the veneration and invocation of Saints: also the stations, and pious pilgrimages, indulgences, jubilees, the custom of lighting candles in the churches, and other such aids to piety and devotion." With all due respect to everybody, St Francis Xavier, I wonder what St Francis Xavier would really think of his arm being detatched from his body, and put on public display. Not to mention poor St Anthony's tongue. I often wonder why Catholic saints never seem to have RIP appended to their titles as we do to other mere mortals who have died. Perhaps it has something to do with the process of canonisation which usually involves the exhuming of the remains and then, if bits can be found, relocating them in elaborate mausoleums or if fully intact, a glass case for viewing. Whatever, it seems that these heroes of the faith are never allowed to rest in peace. The Land Downunder is now hosting Francis Xavier We don't get all his bits, just his right arm. Most of his bits were on public display in Goa in 2004-2005. The right arm has been dislocated from the rest of his body as a religious act of reverence for his ability to bless and baptise. One wonders if the same effect would be gained had the poor man been left handed? There is a difference between Jeff Thompson's baggy green and his bowling arm. I may have expressed my views re-this relic,but wouldn't joke about it. It belongs to the family of Jesuits, the same as a lock of hair of a love one, it's personal. Bad taste to say the least.